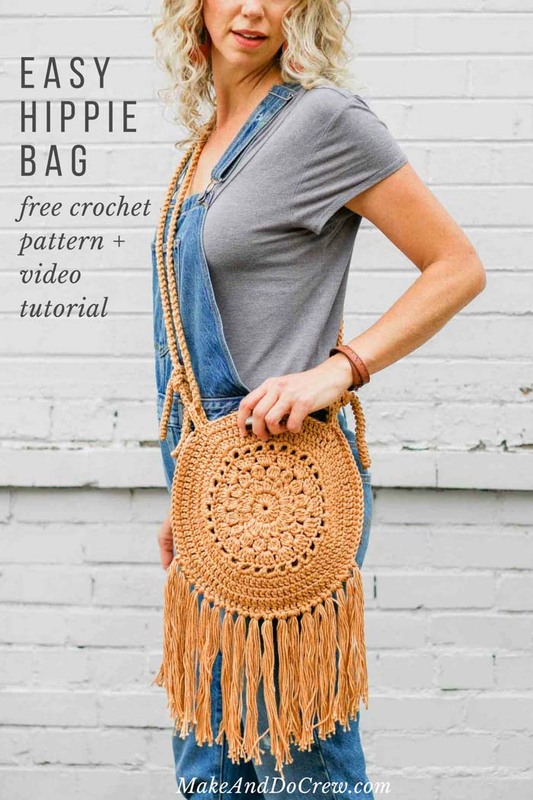 Channel your inner free spirit with this easy crochet boho purse made from two fun circles. Get the free pattern below or purchase the ad-free, printable PDF with stitch chart for $2.99 here. 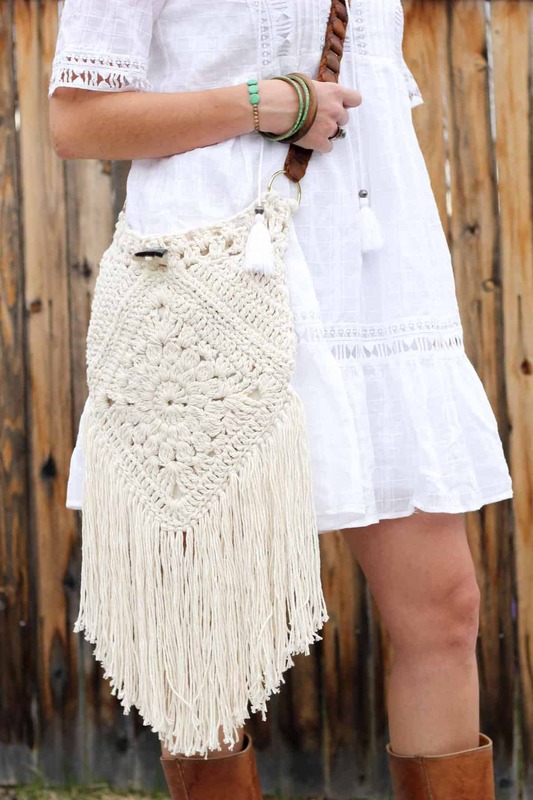 This crochet boho purse is part of a collaboration with my friends at Lion Brand yarn. This post contains affiliate links. Find the Urban Gypsy crochet bag pattern here. I realized recently that the center of that pattern could be used to make a spin off pattern, so I set to work on a circle crochet boho purse. The new version ended up being even simpler than the original! This pattern comes together really easily because it’s made from two identical circles, which are crocheted together to form a little pouch. 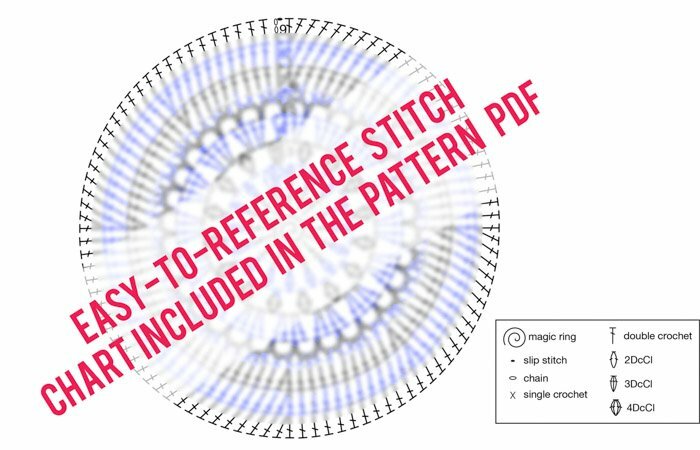 If you’re a visual learner, I highly suggest investing in the ad-free, printable PDF as it contains a stitch chart of the entire circle pattern. Personally, I find charts like this so much easier to read than the written crochet pattern (which, of course, is also included in the PDF!) You can purchase the PDF here. If you’ve been hanging around here any length of time, you know I’m a big fan of Lion Brand’s 24/7 Cotton. I’ve used it on a ton of crochet shoe patterns and it proved to be the perfect yarn for this purse pattern as well. It’s durable and holds its shape while still maintaining a soft and delicate feel. Two strands held together make this bag pattern speedy and surprisingly affordable! 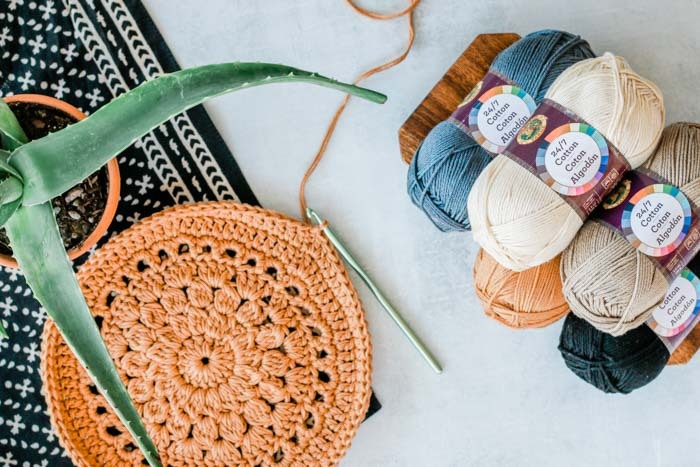 UPDATE: Lion Brand has turned the Street Fair Purse into a crochet kit! You’ll receive all the yarn you need to make your own, plus a printed copy of the pattern. Grab your kit here! 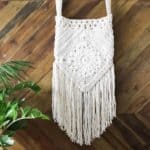 What If I’m Not a Crochet “Hippie” Purse Kind of Person? If you’d rather check peace, love and happiness at the door, this pattern can still make for an awesome cross-body bag. Simply use one of any of the several modern colors in 24/7 Cotton (see them all here!) and leave the fringe off. You’ll be left with a purse that is the perfect size to stash your wallet, phone and a small water bottle–or your WIP crochet project! Okay, let’s get on with boho bag making! 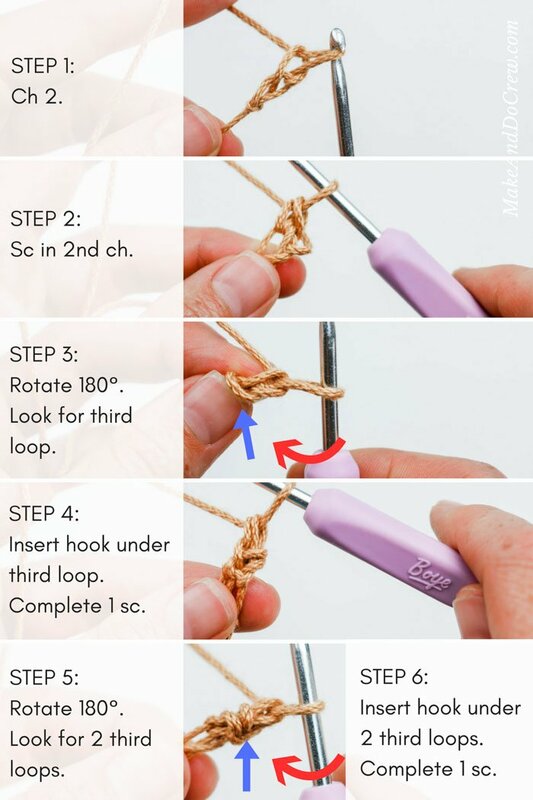 Find the Romanian Cord video tutorial for making the sturdy straps below and the free pattern below that. Happy crocheting, friends! Get support (and camaraderie!) 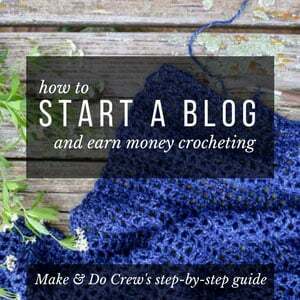 in the Make & Do Crochet Crew Facebook Group here. Purchase the ad-free, printable PDF with stitch chart for $2.99 here. Add this pattern to Ravelry here. 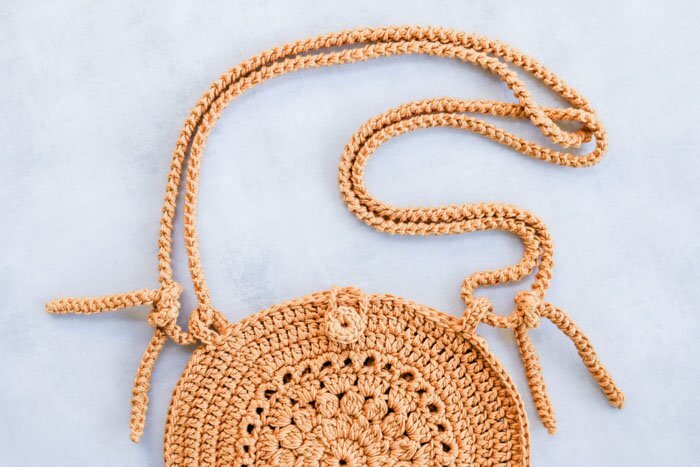 Channel your flower child with this speedy bohemian purse made from two fun circles. 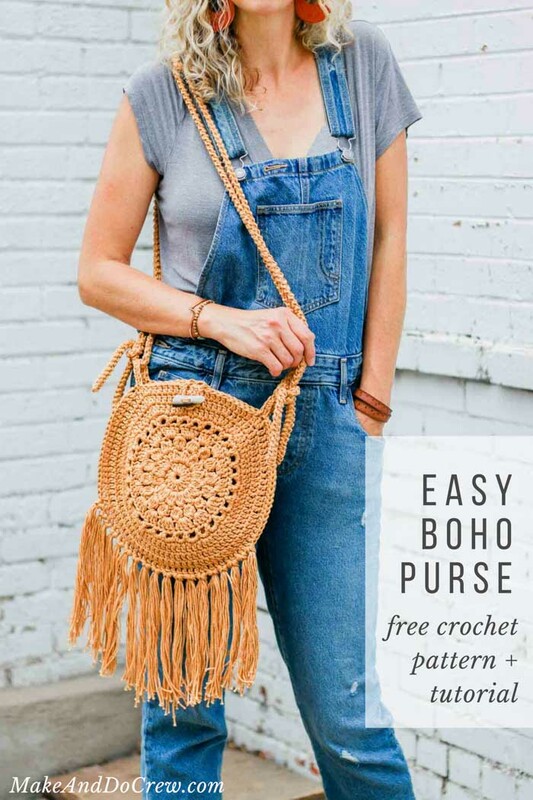 Using two strands of yarn held together and simple stitches, this boho bag comes together quite easily and is the perfect size to fit a wallet, phone and water bottle for an evening concert or dinner out. 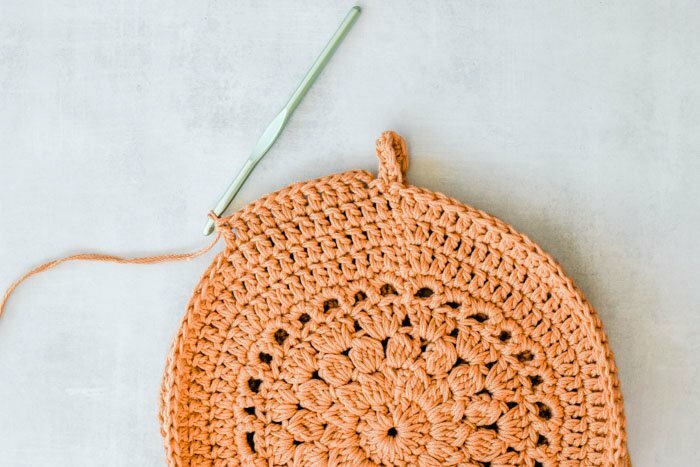 Whether you’re a hippie at heart or just want to add some boho charm to your wardrobe, this crochet bag makes for a satisfying, useful and stylish project. 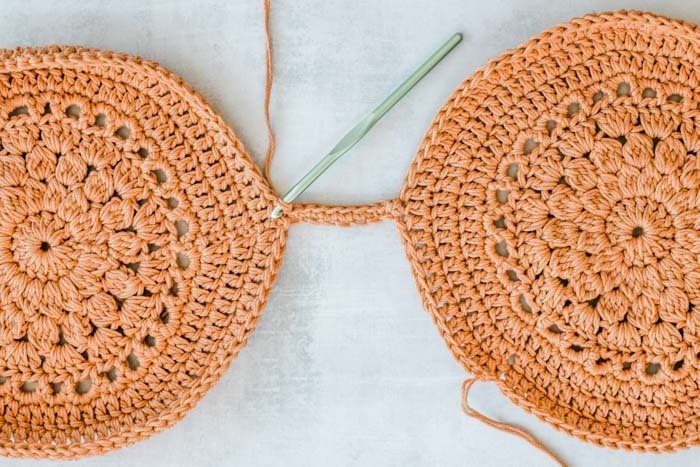 This pattern is appropriate for a confident beginner looking to learn some new skills or an advanced crocheter looking for a project that can be finished by tomorrow. See end of pattern for ideas on adding a leather strap or fabric lining. Purchase a kit with all the yarn + a printed copy of the pattern here. * Purse requires a full 2 skeins. Straps and fringe require a third skein, divided into two balls. 2DcCl – 2 double crochet cluster – yo, insert hook in the designated stitch, yo and pull up a loop, yo and pull through 2 (2 loops on hook). Yo, insert hook same stitch, yo and pull up a loop, yo and pull through 2 loops (3 loops on hook). Yo and pull through all 3 loops. 3DcCl – 3 double crochet cluster – yo, insert hook in the designated stitch, yo and pull up a loop, yo and pull through 2 (2 loops on hook). Yo, insert hook same stitch, yo and pull up a loop, yo and pull through 2 loops (3 loops on hook). Yo, insert hook in same stitch, yo and pull up a loop, yo and pull through 2 (4 loops on hook). Yo and pull through all 4 loops. 4DcCl – 4 double crochet cluster – yo, insert hook in the designated stitch, yo and pull up a loop, yo and pull through 2 (2 loops on hook). Yo, insert hook same stitch, yo and pull up a loop, yo and pull through 2 loops (3 loops on hook). Yo, insert hook in same stitch, yo and pull up a loop, yo and pull through 2 (4 loops on hook). Yo, insert hook in same stitch, yo and pull up a loop, yo and pull through 2 (5 loops on hook). Yo and pull through all 5 loops. • Pattern is worked with two strands of yarn held together throughout. • Main circles are worked in the round. Each round is finished with a sl st to the first st of the round. • Ch 3 at beginning of round always counts as 1 dc. Work these chs quite tightly so as to minimize the potential gap they can create in a round. • See stitch chart on p. 7 of pattern PDF for visual explanation of main circle pattern. Foundation: Create a magic ring (or ch 5, sl st to join). With RS of circles facing out, attach yarn with a slip stitch in front circle (left-handed crocheters: back circle). Ch 8, sl st to back circle (left-handed crocheters: front circle). Sl st into next dc “down” side of circle; turn. Sc in each of 8 chs, sl st to next dc below where yarn was attached. Loop made. Sl st through next dc below strap loop in both circles. Circles now joined. Ch 3, sl st into next dc in front circle (left-handed crocheters: back circle). Sl st into next dc “up” side of circle; turn. Sc in each of 8 chs, sl st to next dc above where yarn ch began. Loop made. • Two identical straps are made and knotted at the end. • This cord requires you to continually turn your crocheting clockwise (left-handed crocheters: counter-clockwise). It may feel awkward at first, but it becomes quite quick. See photo tutorial below or video tutorial at top of pattern for step-by-step instructions. • Continue working with two strands of yarn held together. Row 1: Sc in second ch from hook; rotate stitch clockwise. Row 2: Insert hook under loop at “back” of stitch were two “V”s point to. Work 1 sc under this loop; rotate stitch clockwise. Row 3 and beyond: Insert hook under two loops at “back” of stitch were two “V”s point to. Work 1 sc under these loops; rotate stitch clockwise. Rep Row 3 until cord measures 55”. Cord is quite sturdy, but will stretch a bit once worn. Fasten off and use tapestry needle to weave in ends of cords. To add a closure to top of purse choose to either crochet the button described below or find a wooden, bone or plastic button you prefer. Foundation Round: Ch 5, sl st to first ch to form a circle. Round 1: Ch 1, 11 sc in circle, sl st to first sc to join. Fasten off leaving a 12” tail to sew button to purse. Sew button of choice to whichever side you’d like to designate the front of the purse as pictured in photo in blog post above. Join yarn in center top of “back”circle. Ch 8 (or however many chains it takes to comfortably wrap around button), sl st to dc in center top of back circle. Fasten off and weave in all ends. 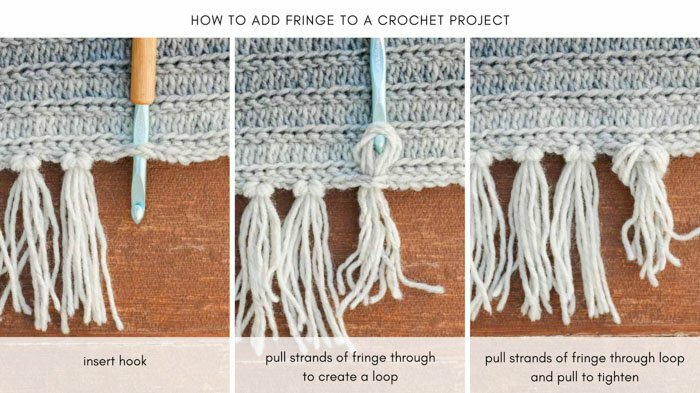 To quickly cut fringe pieces of all the same length, wrap yarn around a book that is approximately 8-9” tall. Cut at one end. Beginning in any dc toward bottom of purse, insert hook from the top down and grab seven strands of fringe. Pull fringe partially up to top of purse. Insert fingers through resulting loop of fringe and pull fringe tails through loop. Repeat in every other dc around bottom of purse. Trim as desired. 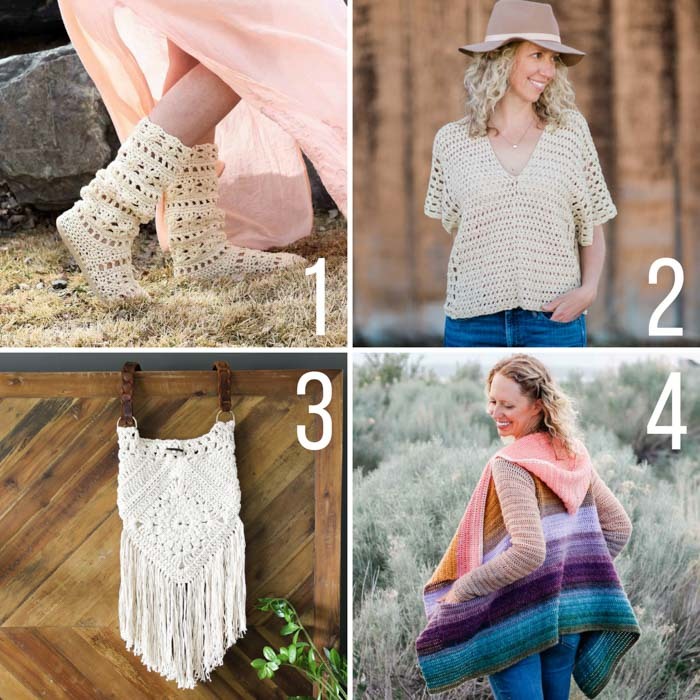 Put your crochet skills to good use on these on-trend boho crochet patterns and tutorials from Make & Do Crew. Find all my free bohemian-inspired crochet patterns here. 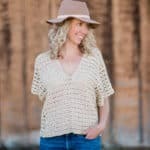 « Easy C2C Crochet Kimono Sweater Made from Rectangles – Free Pattern! I. Love your patterns! Please put me on your email list, so I don’t miss anything. Thank you! I absolutely cannot figure out how to make the strap for this pretty bag – so glad I tried that before making the bag first! I’ve been crocheting for 65 years but still find myself getting stuck on your patterns. Watch the video. It helps. The pattern is great but its very confusing, some of the rows written , are not consistent with the entire pattern instrustions.